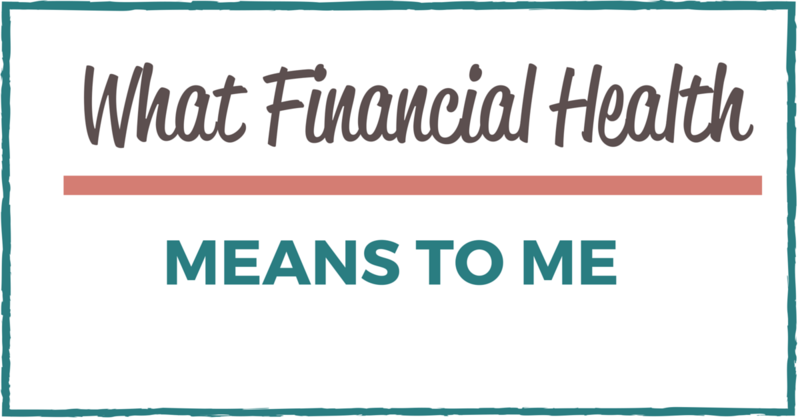 Typically financial health is not a term we use very often, but something most definitely we need to tune into. Of course with the topic of money still being a taboo conversation probably doesn’t help but we can always change that. Financial health is a term used to describe the state of one’s personal financial situation. There are many dimensions to financial health, including the amount of savings you have, how much you are setting away for retirement and how much of your income you are spending on fixed or non-discretionary expenses. Your savings, your retirement cushion, your cash flow (money in/money out) all definitely have a big part of this. CFSI’s Consumer Financial Health Study revealed that 57% of Americans are struggling financially–that is 138 million adults! That’s so crazy to think about! Those who are living paycheck to paycheck. Those who are making ends meet but not happy with where they are at financially. Those who aren’t really aware of what is going on with their money. Those who don’t plan ahead for those bigger expenses nor budget. At one time I definitely fell into the group of those making ends meet but not being satisfied where we were. BUT if I’m being super honest with myself (and you), my financial health didn’t start with the dollar bills or money in the bank. It started with my upbringing, with how I observed my parents treat money. My parents did the very best they could, they worked very hard to provide and for that I am grateful. There is one thing that stands out from my childhood. It was hearing over and over again “we don’t have the money” or “we can’t afford that”. Those two phrases were a huge imprint on my financial health only I didn’t realize it until much later into my adulthood. You see I had already become a great saver, but also a great hoarder of my savings. I took it to the other extreme. I was afraid to spend money outside of the necessary expenses. Why? I didn’t want to be without money. I later realized I continued to hear those phrases “we don’t have the money” or “we can’t afford that” in my head. The unfolding of my financial health continues with confidence. This is achieved not only with the right mindset but with a lot of action towards our financial goals. It also involves reading and learning all I can about money, not just for the money skills + knowledge but the mindset piece as well. Maintaining financial health also needs my patience. Just like you can’t transform your body overnight into one of a body builder you can’t transform your finances overnight. Even though we know this I find that we tend to expect it to happen faster anyways and we get upset when we don’t achieve this in our timeframe. Plus, we tend to start comparing ourselves to other stories out there, but we can’t because personal finance is personal. Our individual situations and aspirations are so very unique. We cannot forget this! Ongoing flexiblity is also key to my financial health. For a while we were doing all the “right” things but we didn’t seem to be getting anywhere! We got stuck with tunnel vision. I realized we needed to be flexible and open to thinking outside what the experts always recommend. Once we opened our minds to this we started to shift and heck our finances shifted too! Over time I have realized that financial health is not just about the money in the bank and the numbers. For me it is also about being in tune to how our upbringing shapes how we treat money. Having the confidence, patience and flexibility to stay the course in our financial journey plays a critical role as well.